"...it's always the one that gets away." 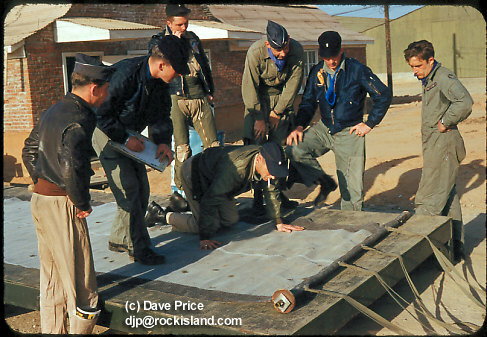 Sabre pilots from 336th inspect a tow target after returning from an aerial gunnery mission. "This afternoon I towed for a gunnery flight led by O'Mally, with Mayberry and Britton. We were at 12,000 and the visibility wasnt any too good. During the course of the flight, I had to vector every member of the flight into the target at least once. O'Mally thought that he had really gotten a good score, though, and was very anxious that I get the target back to the field in good shape. We have been having a lot of trouble losing targets and bringing back just a bar and cable lately, and every few minutes on my way back he would call me to see if I still had the rag. I got it back OK, and even managed to drop it in the right spot despite a mean crosswind. After I had landed I went over and took a look at the rag and there werent more than ten holes in it all together. Poor O'Mally. It would have been better if I had lost it; then he could have told everyone about the wonderful score that he had shot, but Willie lost the rag. I guess its always the one that gets away." I had two rides today. First I flew a gunnery mission with Capt. Krig, Joe Pizza and Hall. I didnt even hit the darn target. I got up bright and early this morning to go on a gunnery mission, but when I got to the line the visibility was down to one mile and we had to wait for it to lift. The old Kimpo Crud was in again just like it was this winter. The smoke from the Kimchi pots in Seoul, Yong Dong Po and Inchon was there in force and the stuff cut the vis down something awful. Finally we got off and went out to the range. We got one firing pass in and then the rag fell off. Hall was towing and he swore that he was only going 165 at the time. Galloway was firing at it when it came off. Sort of shook him up. We aborted the gunnery mission and headed for the area to finish up as an A-4. Our fuel was a bit low, though, and we would up doing a little trail acro. The next time I got to fly was when I managed to talk Holliday into putting me on a tow for another gunnery flight. I dragged the rag off at 120 to try to avoid loosing it on the runway, as we have lost so many lately. A bit hairy. I found myself down to 120 a couple of times in the first thousand feet of climb. It came out OK though and I headed out to the IP. The first leg was no sweat, but when I was on the south leg, Litwin made a pass the likes of which I have never seen before. I thought that he was going to come right up the cable and into the cockpit with me. I called him on it and told him not to make any more like it. All went well until we were about through and then he made another of the same. By then I was so shook up that I didnt know just what to tell him. He was fired-out at the time, so I just sort of asked him not to make any more and kept on going. We have had a lot of trouble loosing targets lately so I held my speed down to 170 through the whole mission. I figured that would certainly be low enough. However, when I was on final for my drop, and about half mile from the end of the runway, I felt a lurch and realized that I had lost the rag. I kept on coming and called the tower to get someone out to try to get the target before the locals got there. The APs went out and made a token search, but had no luck. Capt. Delany then went out with the jeep to see if he could find it, but he had no luck either. Shortly after that Col. Miner turned up with it. He had been at Mobile when I had lost it, and had watched it hit. He had then taken off in his vehicle and gone to where it had hit. When he got there, it was nowhere to be seen, but there were a bunch of local girls nearby, looking a bit guilty. He went up to them and asked where it was. One of them then took him to where they had it hidden -- all wrapped up in a piece of cloth under some bushes. What the locals want with an old target is more than I know. But they sure will take one whenever they get the chance." "Kneeling; Ross or Weed. L to R: Fox, Michaels, Baskett, Alber, Holliday. Hartenbower on R"